Truth be told, I did these try-ons at Barneys last week, but life gets the best of us, sometimes. It's nice to work from the uptown office again, since I can pop into Barneys more frequently and see what's there. Always a fun surprise when there are some unexpected new arrivals! So many that I'm once again splitting this into two posts. The Barneys Exclusive Ace & Jig Atwood Midi Dress in Carnival (size small) seems to be a unique cut to Barneys, as I have only seen the mini version on the Ace & Jig Pinterest. And what a shame! This style in the midi length is incredibly flattering! I never wear anything this fitted and ladylike, so I wasn't expecting to like it at all, but even I did a double-take when I saw myself in the mirror! It creates a really lovely line from the side! And the small side slits at the bottom are a nice touch and make it a bit easier to walk in it. Sizing: Runs a bit on the small size. The size small I'm wearing in the photos would totally have worked on me, but the top was a bit looser than would have been ideal. Sadly, there was no XS in the store to compare to, but I would worry a little that the bottom might be too small in size XS. The drawstring makes it really easy to adjust, so if in doubt, size up! Neckline: Deep split v-neck, without being too revealing, even for me. Extremely flattering. Sleeves: Cap sleeves that aren't too short or showy. Body: Midi length on short gals (like me), knee-length on taller gals. Just skims the body on me in a non-boring A-line shape. It's an improved iteration of the Voyage Midi Dress and the Hannah Dress from previous seasons, but more fitted on top, and without the middle slit that I didn't like about the Hannah. Overall: So hard not to take this home with me! It's a great, work-appropriate dress, and so super flattering. I'm just not sure if it's my style. It's also a tiny bit longer than I'd like for ease of walking, though that could be mitigated with some slightly higher slits. However, this is definitely on my watchlist, and I wish it came in more textiles! If you get an opportunity to try this one on, do it! The Barneys Exclusive Ace & Jig Clifton Top in Carnival (size XS) is a shape that is coming soon in drop 4. Worn with the Ace & Jig Jo Midis in Lunar (size XS). Based on the fact that it's a giant ruffle on top, I wasn't expecting to like it either, but it wasn't too bad! Sizing: It runs a little bit on the small side, and has high armholes that provide excellent coverage on the sides, so I would recommend sizing up if you are bigger on top, since it was pretty fitted on me, and I am smaller on top. It's also quite cropped, as it was a proper cropped length even on me. (I'm 4'11"). The tie could be worn open or closed, and isn't cut too low. Style: The ruffle isn't too overwhelming in the Carnival textile, as it drapes nicely and is lightweight. I have broad shoulders, so I don't love how it visually widens me there, but could be great for those of you who prefer a strong-shoulder look! Overall: A lovely summer top, especially for petite ladies. Ace & Jig Jo Midis in Lunar (size XS) shown with the Barneys exclusive Ace & Jig Vista Top in Lunar (size XS), pajama-suit style. These are pretty much like all of the other Jo Midis from the past few seasons in terms of cut. The textile, however, sets these apart. Lunar is thicker in some places and thinner in others, similar to Chester and Eclipse, which results in a bit of a scalloped hem and different drape, of which I'm not personally a fan. But certainly worth a shot if you're a fan of Jos! Finally, the Barneys exclusive Ace & Jig Vista Top in Lunar (size XS). This one seems to be running true to size, though sizing up wouldn't make too much of a difference either, as there's plenty of room for error. 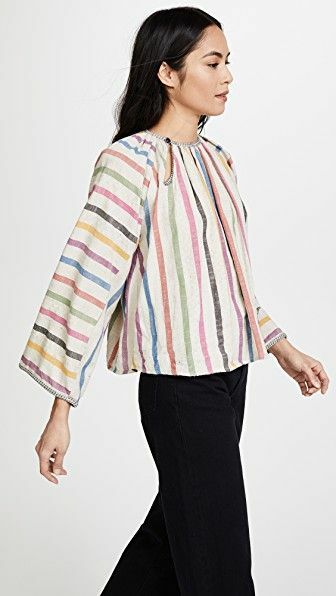 I always have difficulty with these tops, as I find the sleeves a bit overwhelming for me, given my height, especially in a heavier textile like Lunar. The combination of Lunar and Chintz, however, makes more sense to me than some of the other combos out there, as the complimentary weights, colors, and patterns are a great fit. What do you think about these pieces? Do you also wish for more textiles in the Atwood Midi? Look for Part 2 of Barneys try-ons soon! Thanks for sharing, Wendy! I agree that the Atwood midi should come in other textiles. I LOVE the shape but Carnival is not for me. I would love it in Saki or maybe Chester. Maybe if we beg they'll make it an xo!